There’s been a steady stream of rumours about LG, Samsung and others leading up to MWC 2016, but nothing especially concrete — that is, until now. We’ve heard that LG is planning on going head to head with Samsung this year, releasing their 2016 flagship in February rather than later in the year, and for us this is definitely a welcome development. We’ve had a bit of information about the device itself, including its modular nature, but we now have a bit more concrete information thanks to Shai Mizrachi who tipped Android Authority earlier today. 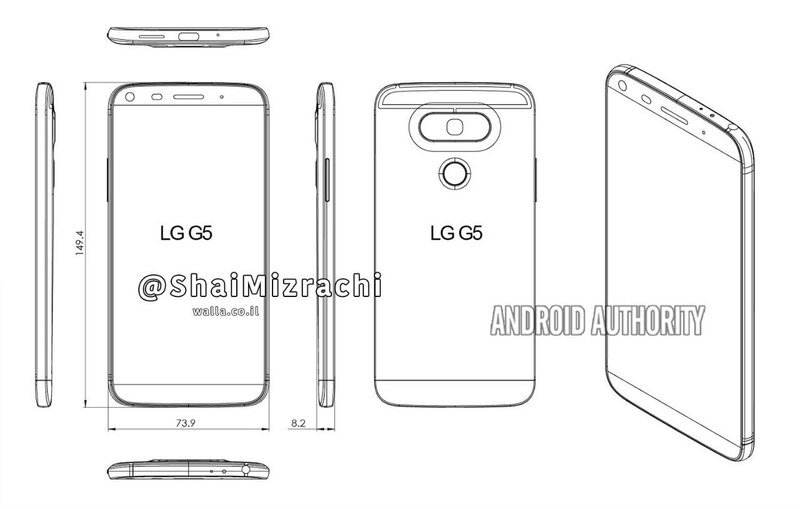 According to the leaked diagram, shown above, we’re seeing a departure from the standard form that LG’s G-range has taken in recent years; the G5 will be a thinner, taller and wider device than those of years past, with expected measurements of 149.4mm x 73.9mmm x 8.2mm. It looks as if the earlier rumours that LG would move buttons from the rear of the phone to the side have also been correct, with the diagram showing the volume keys on the side of the handset. The power button looks as if it will remain on the rear, with a built-in fingerprint scanner. We’ll have to wait and see whether the button will actually need to be pressed to activate the fingerprint recognition, or whether it’ll be tap only as in the current Nexus range. The modular aspect is, as yet, unconfirmed, but the move to an all-metal body seems to be confirmed, and some of the other specifications fit with what we now know; the 5.6″ QHD display makes sense, and it could well be edge to edge with minimal (or non existent) bezels. We’ll know soon enough, with LG already confirming a press event for MWC 2016’s press day. We’ll be attending MWC 2016 this year, and as soon as we know more about what LG have been working on, we’ll of course let you know. Previous Rumour: Huawei possibly to expand into the hybrid tablet market? flat??? I like the curve of my G4! Does the fingerprint sensor become the power button? In all honestly, after using a 5X for a few months, you want a power button on the side sometimes. When the phone is on the table and you don’t want to have to pick it up. As Level380 says you can double tap to wake and if you have a trusted Bluetooth device you don’t need to type in a code (I carry a cheap Mi Fitness tracker on my keyring). And Samsung are trying to compete with Apple, and are losing badly. Doesn’t make much sense to make fun of one Android manufacturer when they’re all getting crushed by Apple.